Extend your trusty sticky arm to catch the candies! Use items and imoveable objects to leverage your cute character and move about the level. Have fun completing all 25 levels of puzzle fun from the developers of IQ ball, Tarzan Ball, and the famous series 'Catch the Candy'! Do you like the Halloween party? 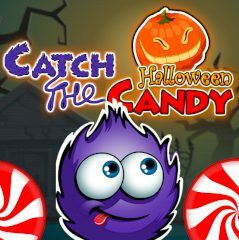 Here you will have to help the little cute purple creature catch all the candies! Do not be scared, cause this night has so many surprises and unexpected events. There are so many objects that you can use, but be very attentive, they are not all available! Use its sticky tongue to grab solid surfaces and overcome all obstacles. Are you ready for such an amazing challenge, where you will have to use all skills of yours? Then go ahead! Do everything perfect and without mistakes, of course! Enjoy the game! We wish you good luck here!